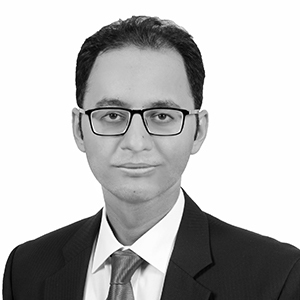 Sikander is a western educated lawyer with over 11 years of international experience in the legal and financial industry (both private practice and in-house), who is currently Senior Associate in the banking and finance team in Al Tamimi’s Banking & Finance team in Saudi Arabia. He has recently been recognized by the Legal 500 as a next generation lawyer in the banking and finance practice area. Previously employed as the Vice President of the legal departments of market-leading and dynamic Islamic banks in Pakistan. Also practiced at Legal 500 and Chambers and Partners rated top-tier law firms in Pakistan. Sikander has extensive experience in conventional and Islamic modes of finance and banking products, syndicated finance, project and acquisition finance, trade finance, debt capital markets (both conventional and Islamic), corporate and commercial advisory, corporate governance and company secretarial matters. Provided legal advisory services to a consortium of banks in connection with a senior secured conventional syndicated term loan facility for the construction of a 5 star hotel and resort of a borrower. Represented a borrower in respect of a senior secured conventional foreign currency term loan facility for financing the development of its fiber optic broadband cable network. Advised a borrower in respect of a senior secured conventional syndicated foreign currency term loan facility provided by a consortium of local and international banks for debt refinancing. Represented a local bank in respect of a conventional syndicated foreign currency interbank term loan facility for the borrowing bank’s general funding purposes. Advised a borrower with respect to a senior secured conventional term loan facility for financing the cost of setting up a Greenfield integrated dairy project. Represented the local subsidiary of an offshore borrower in connection with a guarantee transaction pertaining to an offshore conventional syndicated facility. Advised a consortium of banks in respect of restructuring of syndicated dual currency term loan facilities.